If you are retired or planning for retirement, you may have learned that transferring the burden of generating lifetime income and managing market risk to an insurance company makes a lot of sense. Peace of mind and guaranteed retirement income come through the purchase of an annuity. But which type of annuity is right for you? Which company should you trust your hard-earned retirement money to? Who has the highest returns with the best income payouts? Where do you even start? There are four very distinct types of annuities: immediate, fixed, fixed index, and variable. The type of annuity that is best for you will depend on how soon you need income, your age, your risk tolerance, and other factors. Educating yourself on annuity types and the crediting methods they use can save you from making a disastrous purchase decision. We have created a free educational video series designed to help you get familiarized with annuity terminology and features before you ever talk to an advisor. You can have FREE access to the video series here. Lastly, make sure you have a clear understanding of your own income needs, available assets, and requirements before you speak to an advisor. Most consumers start out by calling their broker or their banker, and it’s true they will be more than happy to assist you in your search. The problem is, these advisors can only sell what’s on their shelves, so to speak. Brokerage houses and banks have what are known as selling agreements for specific insurance companies and specific products offered by those companies. Similarly, beware of “captive” insurance agents. These agents can only show you their company’s product line. Shopping for an annuity with captive agents and limited advisors is like looking at the Grand Canyon through a pinhole. 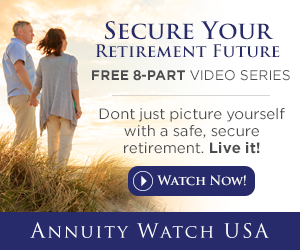 All Annuity Watch USA annuity experts are independent. That means we have the ability to work with all of the best products issued by the best companies, and that means we can find the right match for your exact situation. Let’s face it, some bad agents who work in the annuity space have given the industry a bit of a black eye – either because they intentionally misinform clients in order to make a sale, or because they simply don’t understand their own products. It is critical that you protect yourself by finding an advisor with a proven track record. Remember, it’s okay to ask questions just as you would ask any other professional service provider. In the words of Ronald Reagan, “Trust but verify.” When your annuity is delivered, you have the right to review it for several days before you are bound by the contract. Read the summary and declarations page thoroughly to make sure the terms and rates line up with what you were told. More at Annuity Rates Explained.